What is the range of currency I want to keep in a B rated depository safe? Any answer for someone professional in the safe business to provide you to this question would be an opinion due to the fact that there are multiple security measures you should contemplate other than simply owning a safe. Ideally, the more money you need to keep in the safe, the more aware you want to be of the security protecting the safe itself. Such as, having a depository safe with a couple thousand dollars sitting under the register with a blanket over it compared to having it in a locked room with a security system installed. On a daily basis, how often will I make deposits? As mentioned before, not having to enter a combination or code to open a door just to put things inside a safe saves time and insures longer lasting locks from excess use. If you need to make a safe deposit daily, look no further. Quick and fast deposits save time and worry when it comes to preventing potential lurkers while handling money. 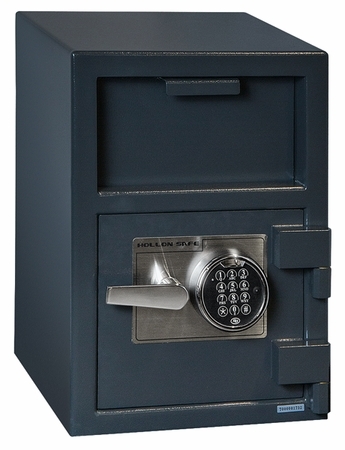 Whereas most safe manufacturers design B rated safes to meet the minimum requirements, (at least ¼” thick steel body with a ½” steel door) they don’t have a variety of different models. Unless you want to find a company to fabricate a safe to your measurements (which can be quite expensive) Hollon Safe Company will most likely have the model that meets your size specifications due to their considerable selection with an additional option of a roller hopper depository or front loading door. For example, their most popular depository safe HDS-2014 stands above its competitor model. Not too heavy, not too light, at 90 lbs. the HDS-2014 is fit for any ideal location and can easily be concealed if needed. With an option of a Sergeant & Greenleaf dial or S&G Spartan keypad this safe is designed to meet the most basic needs one may have for a safe in mind. With 4 bolt down holes, a well-grounded heavy duty safe is not to be taken lightly when it comes to security. Not that looks matter when you shouldn’t show off your safe nevertheless Hollon does have better looking depositories compared to their competitor models such as Gardall and Amsec. LaGard Audit Lock and its Compatability. LaGard Audit locks have been around for many years now and have become one of the most reliable locks used in tracking events at a safe.Â It does take a computer to download the information to the lock.Â Which is not a problem until recently.Â Â With the new introduction of Windows Vista however, things have changed.Â And the software that is loaded on the computer is not compatible with Windows Vista.Â It is compatible with EVERYTHING else in the industry. The AuditGard is a multi-user electronic combination lock that provides superior access control. The lock can be programmed with a Controller, a Manager and eight Users. The AuditGard has a 512 event audit with time and date stamp. Other programmable features include Dual Token (eKey or eKey II), Dual Combination, Time Delay, Time Delay Override (User 9), Silent Alarm, and Remote Signal Override to disable the lock. The AuditGard electronic lock series was designed to increase accountability in the commercial safe market. The Windowsâ„¢ based LG-Audit Setup Software has a user-friendly interface, which allows the lock to be configured directly from a PC. Software features include the ability to vary combination lengths, user activation, lock mode selection, external signal mode selection (used with the 2789 and 4002 alarm boxes) and the setting of time delay values. The LG-View Auditing Software is an essential tool for loss prevention, featuring a searchable audit trail with time and date stamp which provides knowledge of who accessed the lock and when.